A fire incident has taken place on a 320 feet barge outside Thilafushi. 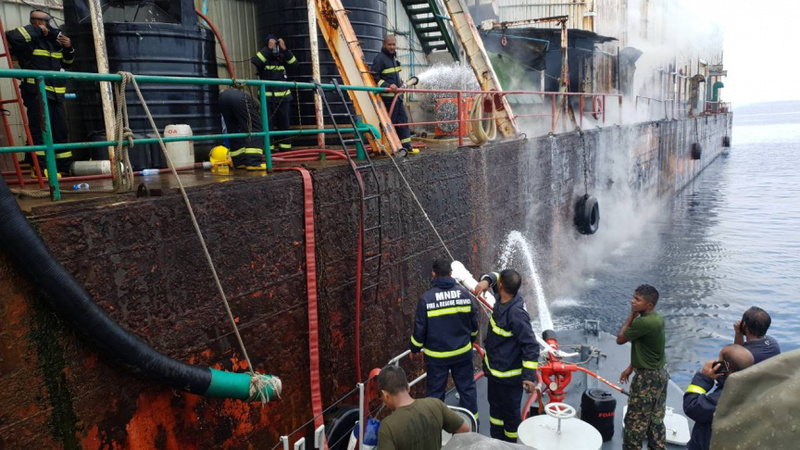 Information Officer of MNDF, Captain Ibrahim Azim, said that a fire incident took place this morning around 7:53 a.m. on a vessel named “Sun Tuna”. There were 20 people were on board when the incident took place on barge that takes in tuna and giving ice to smaller vessels. And everyone was safely taken on to a launch of the Maldives Police Service. Captain Azim said that the MNDF Fire and Rescue Services are working to control the fire. And there was a large quantity of ammonia on board. About 80 percent of the fire has now been controlled and the fire response teams are taking a long time because of the ammonia on the vessel.